Cheapest B/W & colour Print Out. 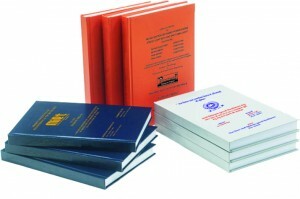 Leather cover With printed with School and college logo as shown in Picture. All Type Project Report for Enginerring , BTech , MTech , Polytecnic Of all the course and subjects like Physics chemistry. Super fine Quality Papaer With Printed covet with Institute logo and and details With full support with Binding At Very Less time Period. A Good and,well laid out and consistently formatted document makes for easier reading and is suggestive of a careful and professional attitude towards its preparation. Remember that quantity does not automatically guarantee quality. A 125 page report is not twice as good as a 85-page one, nor a 11,000 line implementation twice as good as a 5,000 line one. clarity ,understandablity and elegance are invaluable qualities in report writing, just as they are in programming, and will be rewarded appropriately. Try to ensure that your report contains the following elements (the exact structure , chapter titles etc , relevant images. This should include the project title and the name of the author(writer) of the report. You can also list the name of your supervisor if you wish. IMPORTANT: Before submission you should assemble a project directory which contains all your software, READMEs etc. and your project report (source files and pdf or postscript). The abstract is a very brief summary of the report content. It should be about half a page long And Brief summary. Somebody unfamiliar with your project should have a good idea of what it’s about having read the abstract alone and will know whether it will be of interest to them. It is usual to thank those individuals who have provided particularly useful assistance, technical or otherwise, during your project. Your supervisor will obviously be pleased to be acknowledged as he or she will have invested quite a lot of time overseeing your progress. This should list the main chapters and (sub)sections of your report. Choose self-explanatory chapter and section titles and use double spacing for clarity. If possible you should include page numbers indicating where each chapter/section begins. Try to avoid too many levels of subheading – three is sufficient. This is one of the most important components of the report. It should begin with a clear statement of what the project is about so that the nature and scope of the project can be understood by a lay reader. It should summarise everything you set out to achieve, provide a clear summary of the project’s background, relevance and main contributions. The introduction should set the context for the project and should provide the reader with a summary of the key things to look out for in the remainder of the report. When detailing the contributions it is helpful to provide pointers to the section(s) of the report that provide the relevant technical details. The introduction itself should be largely non-technical. It is useful to state the main objectives of the project as part of the introduction. However, avoid the temptation to list low-level objectives one after another in the introduction and then later, in the evaluation section (see below), say reference to like “All the objectives of the project have been met…”. The background section of the report should set the project into context and give the proposed layout for achieving the project goals. The background section can be included as part of the introduction but is usually better as a separate chapter, especially if the project involved significant amount of ground work. When referring to other pieces of work, cite the sources where they are referred to or used, rather than just listing them at the end. The central part of the report usually consists of three or four chapters detailing the technical work undertaken during the project. The structure of these chapters is highly project dependent. They can reflect the chronological development of the project, e.g. design, implementation, experimentation, optimisation, evaluation etc. If you have built a new piece of software you should describe and justify the design of your program at some high level, possibly using an approved graphical formalism such as UML. It should also document any interesting problems with, or features of, your implementation. Integration and testing are also important to discuss in some cases. You need to discuss the content of these sections thoroughly with your supervisor. Be warned that many projects fall down through poor evaluation. Simply building a system and documenting its design and functionality is not enough to gain top marks. It is extremely important that you evaluate what you have done both in absolute terms and in comparison with existing techniques, software, hardware etc. This might involve quantitative evaluation and qualitative evaluation such as expressibility, functionality, ease-of-use etc. At some point you should also evaluate the strengths and weaknesses of what you have done. Avoid statements like “The project has been a complete success and we have solved all the problems asssociated with …! It is important to understand that there is no such thing as a perfect project. Even the very best pieces of work have their limitations and you are expected to provide a proper critical appraisal of what you have done. The project’s conclusions should list the things which have been learnt as a result of the work you have done. For example, “The use of overloading in C++ provides a very elegant mechanism for transparent parallelisation of sequential programs”. Avoid tedious personal reflections like “I learned a lot about C++ programming…” It is common to finish the report by listing ways in which the project can be taken further. This might, for example, be a plan for doing the project better if you had a chance to do it again, turning the project deliverables into a more polished end product. This consists of a list of all the books, articles, manuals etc. used in the project and referred to in the report. You should provide enough information to allow the reader to find the source. In the case of a text book you should quote the name of the publisher as well as the author. A weakness of many Projects is inadequate citation of a source of information. It’s easy to get this right so there are no excuses. Each entry in the bibliography should list the author(s) and title of the piece of work and should give full details of where it can be found. The appendices contain information which is peripheral to the main body of the report. Information typically included are things like parts of the code, tables, test cases or any other material which would break up the theme of the text if it appeared in situ. You should try to bind all your material in a single volume and create the black book. Complete program listings should NOT be part of the report except in specific cases at the request of your supervisor. You are strongly advised to spend some time looking at the reports of previous project students to get a feel for what’s good and bad. All reports from the last few years are available in hard copy form in the CCCF and as soft copy in the student Projects Section. 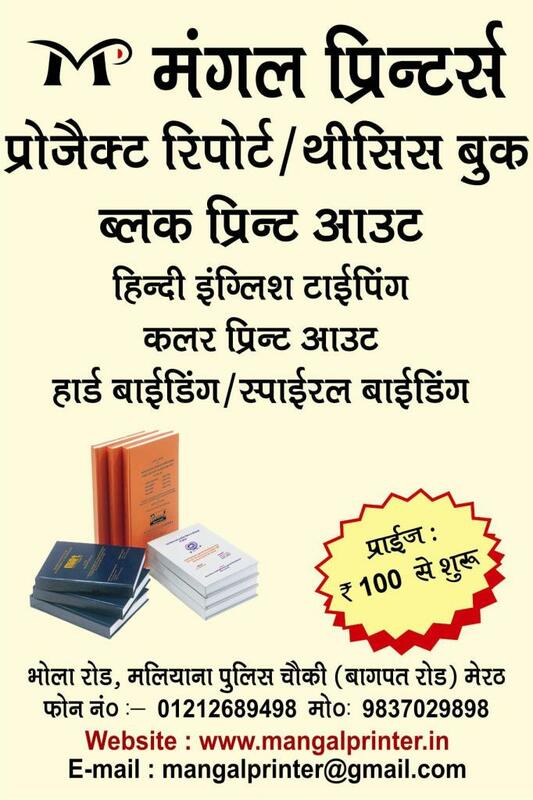 Printing Binding All Types Of Project Reports Of all institutes Of Meerut , Muradnagar , Modinagar And Baghpat.